I wanted him to do well,but it is just really painful to watch! I'm freaking more about the O-Line now. Kyle DeVan (G) apparently injured a hammy today. This is getting really ugly. yea heard about DeVan,anymore news on Jacques McClendon? 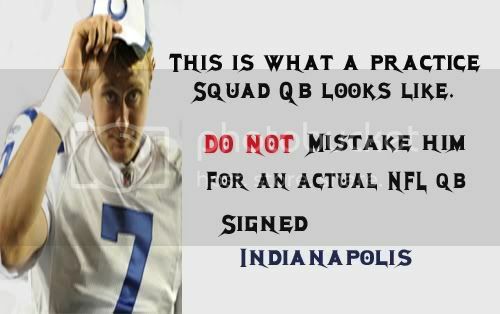 I think that the Colts are going to be fine with their QB position. Not just because they have a Hall of Famer in Peyton but due to the fact that they have such a Good offensive nucleus there with their players and coaches. I am interested to see what will come of the offense without Tom Moore being on the sideline chewing that gum and looking over top of his glasses. The same scene everytime & I Love it!! Cool Man!! I've never understood why the Colts never had an experienced guy backing up Peyton. But maybe they see something all of us don't see in guys like Sorgi and Painter, it worked for the Pats a couple of years ago I guess. But there isn't a team that is in a worse position than the Colts if QB1 goes down. You might as well close up shop for the year if 18 goes down with any kind of injury. Why not have a guy with some experience who can be a spot starter if called upon, it's not like the Colts are looking to develop a QB. Jeff Garcia was on Mike and Mike this morning, and he is playing for the Omaha Barons (I think that is the team name) in the minors. He would be a great grab for a few years of insurance until Painter gets a pulse. Just call up my avatar. All he needs is a clipboard, visor(to be worn backwards) and an electric razor to keep his designer stubble in tip-top form. After a half, a quarterback controversy in Indianapolis as Curtis Painter is 3/3 for 83 yards, a TD, and 158.3 rating. That scrub Manning was only 8/15 for 91, a TD, INT, and 66.3 rating. With Manning expected to be the highest paid player in the history of the NFL, it only makes sense to save the money and cut him. Curtis Painter is still a Colt. Curtis Painter,what are we missing?